Championship strugglers Wolverhampton Wanderers have signed defender Kaspars Gorkss on an initial three-month loan from Premier League side Reading. After completing a medical on Monday night, the 31-year-old Latvia international has joined Wolves with a view to a permanent move. "I think he can help take us where we want to go," said boss Dean Saunders, after sealing his first senior signing. "He is strong, brave, no-nonsense player, who will put his head in." Gorkss won promotion to the Premier League in successive seasons with Queens Park Rangers and Reading, but his task for the next three months will be trying to keep Wolves up at the other end of the Championship table. He began his career in England with Blackpool in 2007 before signing for QPR the following year. 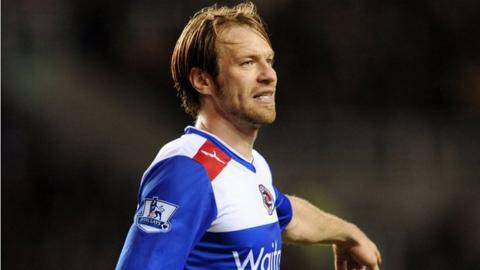 After playing a leading role in their promotion-winning side under Neil Warnock in 2011, he then moved on a three-year deal to Reading, who he helped to the Championship title last May. However, he has not featured for the Royals since their 5-2 home defeat by Arsenal on 17 December. "This is a start of what I am trying to build here," added Saunders. "Kaspars has been with teams who have been promoted from the Championship over the last two years and is 31, which is a good age for a central defender." Reading have a 24-hour recall clause on the loan after the first 28 days.